We assume we know our bodies intimately, but for many of us they remain uncharted territory, an enigma of bone and muscle, neurons and synapses. How many of us understand the way seizures affect the brain, how the heart is connected to well-being, or the why the foot holds the ke... read full description below. We assume we know our bodies intimately, but for many of us they remain uncharted territory, an enigma of bone and muscle, neurons and synapses. How many of us understand the way seizures affect the brain, how the heart is connected to well-being, or the why the foot holds the key to our humanity? 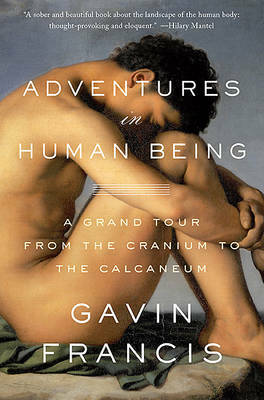 In Adventures in Human Being, award-winning author Gavin Francis leads readers on a journey into the hidden pathways of the human body, offering a guide to its inner workings and a celebration of its marvels. Drawing on his experiences as a surgeon, ER specialist, and family physician, Francis blends stories from the clinic with episodes from medical history, philosophy, and literature to describe the body in sickness and in health, in life and in death. When assessing a young woman with paralysis of the face, Francis reflects on the age-old difficulty artists have had in capturing human expression. A veteran of the war in Iraq suffers a shoulder injury that Homer first described three millennia ago in the Iliad. And when a gardener pricks her finger on a dirty rose thorn, her case of bacterial blood poisoning brings to mind the comatose sleeping beauties in the fairy tales we learn as children. At its heart, Adventures in Human Being is a meditation on what it means to be human. Poetic, eloquent, and profoundly perceptive, this book will transform the way you view your body. Gavin Francis is a physician and the author of True North: Travels in Arctic Europe and Empire Antarctica: Ice, Silence and Emperor Penguins, which won the Scottish Book of the Year Award, was shortlisted for the Ondaatje Prize and the Costa Prize, and was named a best book of the year by The Economist and the Financial Times. A regular contributor to the London Review of Books, the Guardian, and the New York Review of Books, Francis lives in Edinburgh, Scotland.